Defining objectives and key results is just the beginning of your OKR journey. Without follow up and follow through, the whole exercise will be a loss of time, effort, and energy. To ensure that teams are focused and driving objectives forward, it is important to have a regular, usually weekly, follow up meeting where progress, priorities, obstacles, and small victories are discussed. This meeting is normally referred to as a ‘Check-in’ or "Retrospective Meetings". They should be regular and short, straight to the point, and useful. In the Gtmhub platform, there are few places from where you can access and update your key results. However, the best place to do this is the Hub. The Hub is the place for all your items. You get a quick access to objectives, key results and tasks owned by you and the teams you're part of. Use the green Update buttons on the right side to update your key results. Once you do this, the button will fade out but you can still do updates if needed. According to best practices, you should be updating your OKRs on a weekly basis even if you don't have progress to report against. In Gtmhub, the updating process is done in three steps. Let's say your key result is Increase customer satisfaction rate to 90% and your last week number was 65. If your number has changed, you can update it or skip this step if there's no change. In either case, you might want to give more context on why there is/isn't progress on your key result. 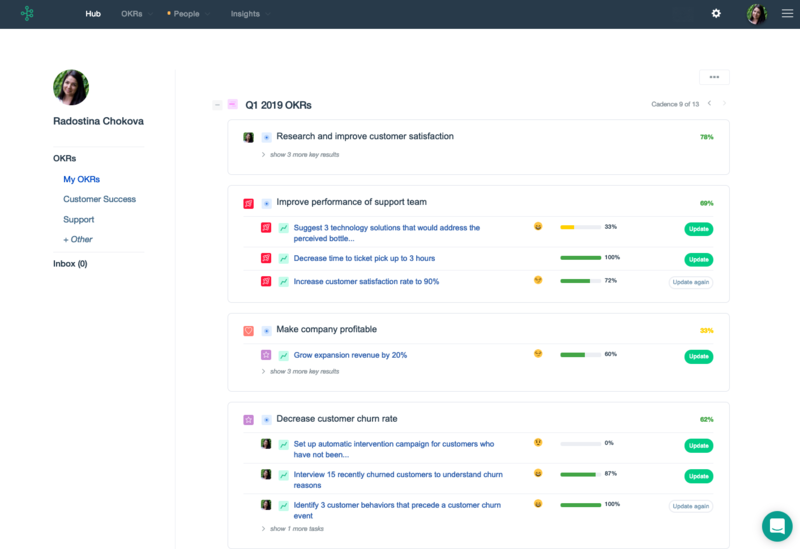 Gtmhub stores all Key Result update notes and you will be able to track your progress throughout the OKR cycle. This would make it easier for you to spot areas for improvement. Notes are a mandatory field in the form. You cannot save your update without writing up a note. ProTip: You can use @ to mention people in your notes. Reach out for help or praise someone for helping you with that project you're working on. Gtmhub has the option to write a comment under the Key Result's note which makes collaboration more effective and contextual. Depending what your account administrator has set up for you, you might have three options for confidence level scale: number (0 to 1 or 1 to 10), emoji or text. Make sure you utilize the field according to your subjective view on how this key result is progressing. Do you think there's a fair chance to miss your target? Then, lower the confidence level on that KR and make sure your note provides more context on the possible roadblocks. If you feel optimistic - increase the confidence level so it reflects your expectations. In addition to this, you can also control who gets to receive an email notification with your key result update.